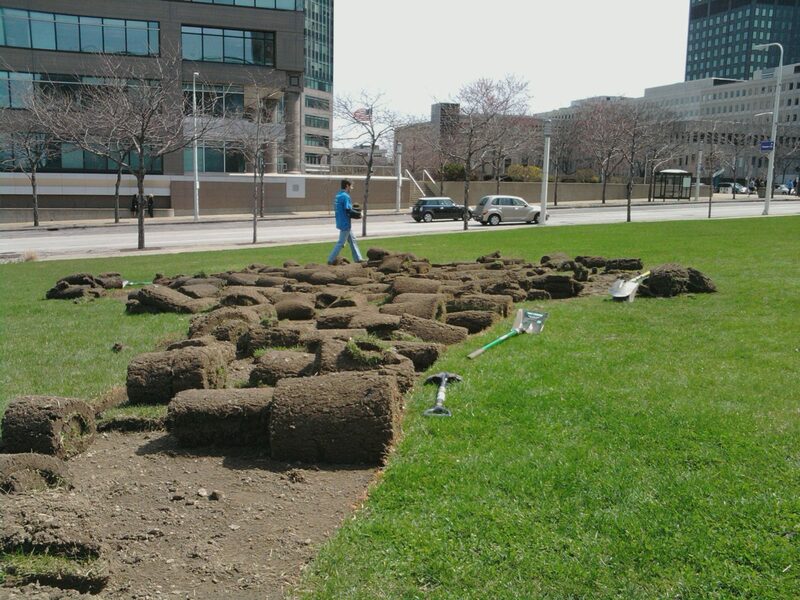 You know how you and your friends used to always talk about how cool it would be to take the grass on your lawn and just roll it up and carry it from one end of the yard to the other? The Cleveland Indians front office had–hold on a second–as I’m typing this entry someone is now informing me that they never once thought that would be a cool thing to do. Regardless, the Cleveland Indians front office had the opportunity to do just that today. 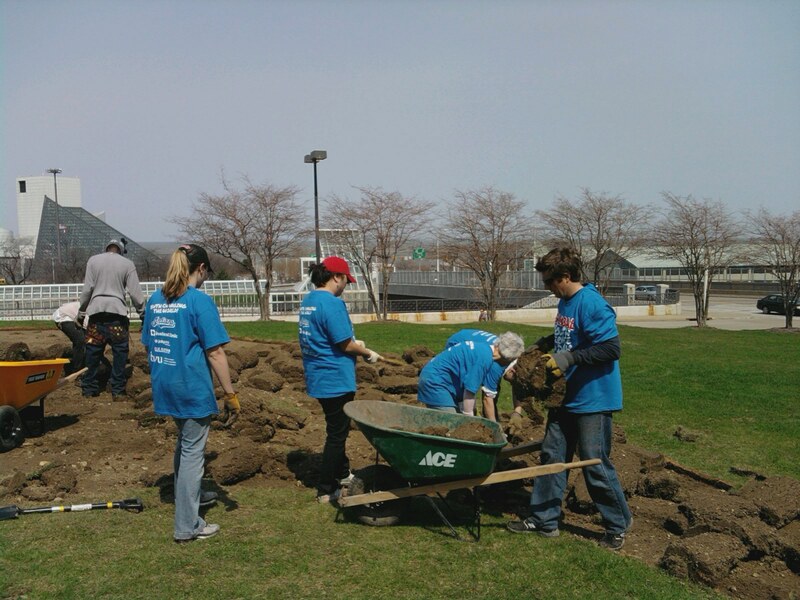 As part of Global Youth Service Day, Indians employees partnered with the Cuyahoga County Board of Developmental Disabilities and made their way to the corner of East 9th and Lakeside to put in an urban garden and a brick walkway right next to the giant Free Stamp. The 5 hours of volunteer work consisted of rolling up what seemed like a couple hundred rolls of sod and then moving them to pallets, planting apple trees, moving bricks so that they could be layed out into a walkway, raking dirt and top soil and everything else that goes along with putting in new landscape! While there were about 24 volunteers at this particular project, there were over 1,400 volunteers all over Northeast Ohio participating on various other projects to celebrate Global Youth Service Day (GYSD). Established in 1988, GYSD is the largest service event in the world, and the only day of service dedicated to children and youth. GYSD is celebrated each year in over 100 countries. The weekend of volunteering caps off on Sunday, April 17 with all of the participants enjoying a day at the ballpark. All volunteers were invited (and provided tickets to) watch the Cleveland Indians take on the Baltimore Orioles for the 1:05pm game. They will take part in a pre-game parade around the warning track as well as be recognized on the field in front of the crowd. So the next time you take your girlfriend or boyfriend on a date to the Free Stamp in Willard Park (do people do that? ), or you’re walking back from a Cleveland Browns game–be sure to stop and enjoy the apple trees and the brick path and know that your Cleveland Indians had a hand in making the city look pretty.